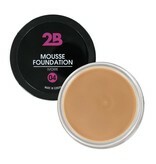 Minor imperfections immediately disappear with 2B Mousse Foundation. This light, soft and waterproof texture helps you achieve a natural finish. Great coverage. Dermatologically tested. Made in Europe.